A secret POW camp radio that inspired the classic WWII movie Stalag 17 is up for auction in California next week. 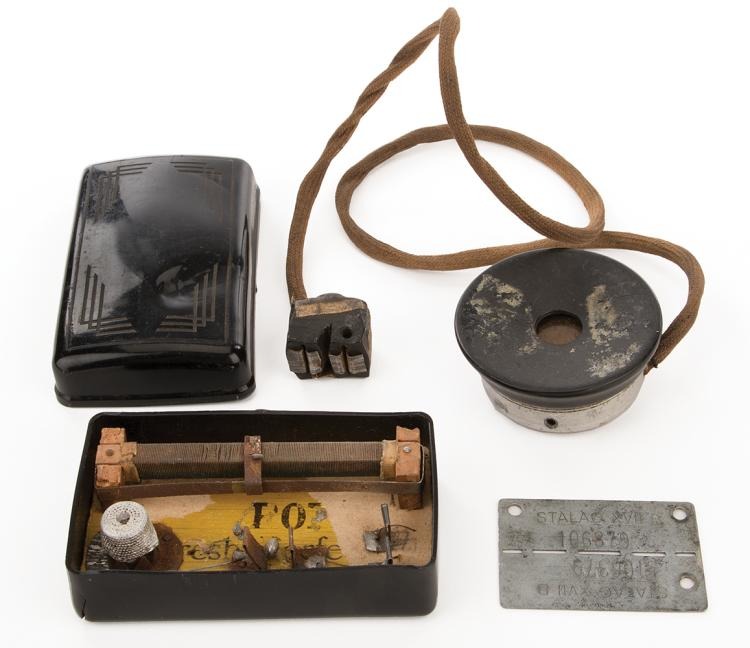 The radio, which was used by American prisoners to receive news about the war, could sell for up to $50,000 when it comes up for sale at Profiles in History on June 8. The crystal radio set belonged to Sgt. James L. Cast, an American gunner whose plane was shot down during a bombing raid over Germany in April 1944. Cast and two other crew members survived, and were captured by the Nazis before being transported to the notorious Stalag 17-B camp in Austria. They remained prisoners of war for over a year, during which time Cast constructed the radio and kept it hidden from the German guards. It was a highly risky undertaking, as any POWs caught with a radio would have been immediately executed as a spy. "The crystal and the German aviator’s earpiece were traded for cigarettes by American prisoners who spoke German. The soap box was standard issue. The components are just wood & wire…The crystal is embedded in a thimble! "I was told they would move the key to reach Berlin, then by moving a few wires further over they would get BBC. This was made between 6 May 1944 and 6 June 1944 as they heard about D. Day before the guards knew about it. "When they finished listening or had to close up, the crystal went into a pocket, the lid on the soapbox, and it just sat there. The Ear piece went into an enlarged knot hole on the inside part of a berth." Cast and his fellow surviving prisoners were finally freed from Stalag 17-B at the end of the war in May 1945, and were rescued by advancing US troops of the 13th Armored Division. In 1951 two former prisoners, Edmund Trzcinski and Donald Bevin, wrote a hit Broadway play about their experiences in the camp. The play was then adapted for the silver screen by celebrated director Billy Wilder, and the 1953 movie won actor William Holden the Academy Award for Best Actor. In both the play and the movie, the secret crystal radio set was a key plot device. The radio set has been described as "an incredibly historic WWII artifact that permeated into pop culture…worthy of inclusion in the world’s finest military collections."